The Clifton Film Academy recently visited FLP and produced this wonderful bio of the work that we do. We are very excited about the other projects that we are partnering in with them and hope to produce even more material of this standard! For the 50’th anniversary of CCIRA, FLP was invited to present on “Ingredients for Culturally Responsive Teaching”, as well “International Partnerships” and the benefit to Literacy Development. It was a privilege for us to be invited to present with expert educators, in Denver Colorado. The session was fully subscribed and valuable interaction ensued in the question and answer slot of the presentation. It was good to have 2 Educators, Jan Killick and Judy Casey attend the conference as they have both worked with FLP in the past. In Addition to this presentation, FLP shared about the community work we do, particularly through our Libraries and Reading Groups. The Foreign Affiliate Grant was established by CCIRA to encourage the sharing of best practice between, amongst others, FLP and CCIRA experts. I look forward to the training partnerships that we are currently working on with CCIRA. From Colorado, I travelled to Boston to present about FLP’s Community Libraries and the African Storybook Project (ASP). It was a privilege to be hosted at Primary Source and present to members of MRA, Educators and Rotarians from Boston. Judith Baker presented about ASP and the value of the work FLP has done in collecting, translating and motivating the writing of Zulu stories in our rural communities. The stories produced and their use in the FLP Groups and Libraries aroused interest amongst attendees with many offering to assist with translating the stories into minority languages in the USA to be used in Schools there. Frances Jefferies, a Rotarian from Boston, shared about the partnership that they have with FLP through MRA and the benefits that FLP derives from Rotary support. I was invited to Present at schools in the Seattle School District with whom we have a partnership – we have worked together for 13 years. It was an inspiration to see the student led clubs working towards collecting resources for FLP and supporting our reading and literacy endeavours. A presentation was done for Teeter International, as one of FLP’s major funders. All staff were present and the CEO spoke about their contribution to development in SA and particularly their relationship to, and support of, FLP. Philangethemba Molweni Community – FLP started training 12 ladies from Molweni Community for the Khulisa Abantwana Home Visiting Programme. This initiative is a partnership between FLP and St Agnes Church, which has developed a Community Centre in Molweni. The introductory 2-day workshop was very well supported, with prospective Home Visitors excitedly receiving their bags, containing their Educational toys and Books, and venturing off into their community to commence their ECD Home Visits. It was encouraging to see that the African Storybook Project books, that FLP produced, piloted and translated, form part of the pack of books that would accompany the Home Visitors into the homes they would begin visiting regularly. FLP Literacy Campaigns – To promote the FLP libraries and make communities feel at home and visit more often, we constantly run special days where we advertise events at the libraries where all are encouraged to visit and promote reading and storytelling. We hosted Home Visitors for a picnic where they met with FLP Coordinators and Facilitators to discuss their home visit, the families visited, the challenges faced and significant change that they have seen in the families that they visit. Games get played, songs sung and ideas shared. Other members of the community get invited to see what the programme does and thereby promote similar practices in their homes and communities. The National Read Aloud Day was celebrated in the FLP sites, schools and Libraries. Members of the community, teens and emergent readers all had an opportunity to read a Nali’bali story aloud, or if they were illiterate, to be read to. 3798 readers participated in this campaign. “Enter Another World – Read” Programme Pilot – FLP Teaching Interns, that have been trained by Shelley O’Carrol from Wordworks and the Underberg Mastery Unit, are working on foundation phase reading skills in 3 rural schools in Goxhill, Camanga and Underberg School. The Reading Programme aims to make reading fun and provide remediation to struggling readers. A baseline assessment was conducted and monitoring is taking place. We are confident that this intervention – 3 days per week in each school – of Intern based reading and 2 days of personal reading, will develop the confidence and ability of readers in the schools. We aim to promote reading as a leisure activity and not a punitive school practice. This is done by using dramatization, read aloud sessions with questions and bright books in local languages. 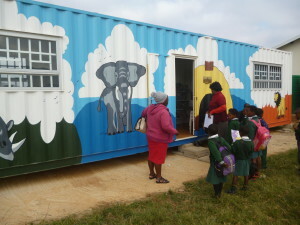 The African Storybook Project Books are being printed and will be placed in corner libraries in these schools. The new FLP Kwabhidla Community Library: This project is now firmly back on track. The Ingonyama Trust has extended the lease. We have received the Lease Documents from Ingonyama and are anxious to start construction! We are extremely grateful to the Daitz Foundation and Project Build for their continued support in this initiative. They have approved a new budget that considers the delays and thus the library will meet the specs originally planned when the initiative was begun. The construction of FLP’s newest Community Library will begin in 2017. All that we are able to achieve at FLP is as a result of the phenomenal Team that I am privileged to be surrounded by, as well as the funders that passionately support Family Literacy in Southern Africa. I would like to begin by congratulating the FLP Team for their resilience, focus, commitment to developing their communities and selfless way that they make themselves available to all. Many of our staff have been with us from early 2000 and thus bring with them a wealth of experiential knowledge, ensuring that we remain relevant in the communities that we serve. 1. Community Work Programme – Khulisa Abantwana Home Visiting: After a protracted set of negotiations and intensive planning, we are very happy to announce that FLP and our CWP partners, the Dhladhla Foundation, will revive the Khulisa Abantwana Home Visiting Programme in the Ubhuhlubezwe and Ingwe Municipalities. We are confident that this valuable programme, which came to a very untimely end when our previous partners were not reappointed, will continue to provide families in isolated rural communities with opportunities to learn through play, develop a love for reading and develop the confidence to engage their children as their first teachers. Dhladhla is very committed and has appointed a phenomenal team to work with FLP. Thank you must be extended to the Dhladhla Team, LIMA and our Programme Coordinators, Zimbili Dlamini and Florence Molefe, for patiently attending multiple meetings and motivating the value that this programme represents to families. The 75 appointed Home Visitors will, after being trained by FLP, visit 4 homes each, once a week – that represents 300 homes! Many of these homes have 4 -5 children that attend these sessions. 2. Evaluation of the Khulisa Abantwana Home Visiting Programme: Linda Biersteker recently completed a very intensive evaluation of the FLP Khulisa Abantwana, Home Visiting Programme. Her insightful and experienced research has inspired us to focus more of our attention on some key themes: conducting more home visits – her recommendation is that we visit each family once per week (for this we need to raise additional funds), more reading with adults and children, undertaking research into traditional and local ECD practices and providing more opportunities for families to regularly engage in reading and play activities with children. The full evaluation is available online on the Family Literacy Project website. 3. Uthando Doll Makers Workshop: From 6 to 9 June, a group of Unthando Doll Makers, from Australia, visited FLP in order to visit our Libraries, accompany Home Visitors to homes as well as run a 2 day, doll making workshop for Facilitators, Coordinators, Interns and Community members. Much fun was had by all attendees, with many having returned since, to show us the dolls that they have since made. Phumy and Zimbili, FLP Coordinators, have since conducted workshops at our libraries, where they taught teens how to make dolls for siblings and themselves. As most of the homes we visit have very few toys or none at all, these dolls are a wonderful resource. It is so endearing to watch boys and girls play with the culturally appropriate dolls with such affection and concentration. The dolls never fail to bring a smile to the saddest of faces when they are removed from the Home Visitor’s bags. 5. International visit from Zoe Sylvester, Head of York House UK: Zoe Sylvester, visited FLP in July and August in order to provide training and explore avenues for future partnering. Zoe brought suitcases of the most beautiful books for our Home Visitors and has indicated that she will continue to collect educational toys and books for FLP. We are excited about twinning with York House and the opportunities that this will present for the Khulisa Abantwana Home Visiting Programme as well as Toy Libraries that we are developing in all of our sites. 7. Family Literacy Project Community Library’s Holiday Programme: Many children attended our library’s special programme during the holidays in order to join in the many fun reading and craft activities. Lotheni Library: Many children attended the holiday programme at the library and even some parents came along with their children. There was a doll making workshop which was done with the teenagers in the community. Parents were very happy about that as they said their children can`t use a needle so they are happy that they began to learn sewing skills. 96 children attended the holiday programme and 92 books were borrowed in that week. Stepmore library: There were 131 children visited the library during the holiday Programme. Teenagers came for doll making which they all said was a good skill for them to learn. They enjoyed what they did and continue to come to finish their dolls. 101 books have been borrowed during this month. Mpumlwane Library: Having newspapers and magazines in the library encourages adults to visit the library more often. Some community members come twice a week to read the newspapers and they always bring their children with them to the library. While they read the newspapers, children play with educational toys, get read to, and read themselves. During the Holiday Programme, we had 126 children in the library and 64 books were borrowed. 8. The new FLP Kwabhidla Community Library: The Ingonyama have assured us that they will extend the lease on the property that they have so kindly given to FLP. We are extremely grateful to the Daitz Foundation and Project Build for their continued support in this initiative. We remain optimistic that the construction of FLP’s newest Community Library will begin in 2016. The FLP Team started the year with renewed vigour and focus. At our planning and reflection session, Facilitators emphasised how they would like to deepen the impact and “grow” the work FLP does in their respective communities. I am so encouraged to see how the Facilitators wish to develop their communities through their Adult Groups, Reading and Home Work Clubs, Toddler Groups and the Home Visiting Programme. Khulisa Abantwana Home Visiting: FLP Adult Group Members continue to provide much needed ECD, Health and Psychosocial support for homes within their neighbourhoods that have children from 0-6 Years old. All of the groups have received new books, educational toys and beautiful Uthando Dolls to be used in the Home Visiting Programme. Almost all of the homes visited have no toys and thus we find that the toys brought by the Home Visitor are very well used, some getting completely worn out in the space of a couple of months. Uthando Doll Makers from Australia and Tasmania as well as Generation Joy Foundation in the USA have provided beautiful dolls and toys for our groups. Linda Biersteker is set to begin her evaluation of this programme in May. We are excited about having her scrutinise this valuable programme and assist FLP to ensure that we are meeting Community expectations and at the same time providing vital educational support to the 0-6 year old children we reach. Book Sharing: After an enquiry from Reading University in the UK, I was very privileged to meet the development Psychologist, Professor Lynne Murray – Author of “The Psychology of Babies” and Professor of Psychopathology Peter Cooper, about a Book Sharing Project that they are running in conjunction with Stellenbosch University. They are extremely enthusiastic about reading to and with children. They have developed sound, evidence based training material, which they have shared with FLP. They have expressed interest in our Home Visiting Programme and the model that FLP uses. We have exchanged material and I am confident that the partnership that we have established will extend our reach and thereby benefit even greater numbers of 0-6 Year Old children. They are visiting SA again in 2017 and are coming to FLP to visit sites and spend time with the FLP Team. Underberg Himeville Arts Festival: Kyle Allan, a Drama Teacher and Poet, is hosting an Arts Festival in Underberg from 30 September to 2 October. He has run various workshops for the FLP Youth in Underberg and Himeville and has offered to assist FLP Drama Groups by running workshops for them. He wishes to partner with FLP in this Festival endeavour and assist the Drama Groups and Teens with Poetry and performances for the Festival. What we have proposed is that, over the Festival period, we use the FLP Libraries as venues for local poets, authors and artists to run workshops and intimate readings and talks, “Conversations that matter…” where we hope to inspire and develop the poets and authors in the areas that the FLP Groups and Libraries serve. Thus far we have confirmations from Uthando Books – they plan to send 2 Authors to go out to the FLP Libraries, Zuki Vutela ( Zookey Zarling), Niq Mhlongo- novelist and short story writer, Malaika wa Azania- writer, Nati Ferreira- writer ( English / Afrikaans ), Gary Cummiskey- poet and independent publisher, Thola Antamu- drama. Nakanjani Sibiya- isiZulu writer; Menzi Mkhwane- drama; 2 Lesotho poets and Local Authors from Underberg. It is very exciting that we have been afforded the opportunity to be part of this endeavour as it will bring published authors to our libraries to meet directly with their readers and encourage them in their literacy endeavours. iThemba Projects: We are excited about a partnership that we have established with iThemba Projects in Hilton. They are a community based ECD NGO that work in the Sweetwaters Community. They wish to develop a Teacher’s Training Centre, modelled on the Asifunde Sonke Centre. In addition they have requested to use our Khulisa Abantwana materials in their Home Visiting Programme. We know that the knowledge exchange programme that we have set up will be mutually beneficial. Valley Trust Family Literacy Training: Phumy Zikode and Nomvula Phoswa continue to provide training and support for our partners, Valley Trust in Botha’s Hill just outside Durban. Phumy and Nomvula continue to travel to meet and train the Valley Trust Facilitators and monitor and evaluate their progress. The Family Literacy Groups being run by Valley Trust are vibrant and well managed according to the M&E visits that Phumy and Nomvula have made. FLP Community Libraries and the Holiday Programme: It has been an exciting month at our FLP libraries during the school holidays. The activities have focused on reading as fun and art and craft. Children attending the holiday programme engaged in various activities such as the colourful light ray cross, Easter egg paper plate basket, Egg balloons, Easter bunnies, Easter pom-pom, cutting out mini books from the Nal’ibali supplement to take home with them, dramatizations and role play performed from stories that they had read or made up and of course, the read aloud aspect where children listen to stories every day. In our five community libraries, every term, we run a full day training workshop with library assistants and coordinators. After each holiday we run another workshop to find out what worked well and what problems they encounter during the holiday programme. Many children have been attending the holiday programmes. This term, for the holiday programme, we managed to reach 514 children in all FLP libraries. The new FLP Kwabhidla Community Library: Unfortunately, this project continues to be delayed. The Trust has been very accommodating and is awaiting a letter from the funder, the Daitz Foundation, committing to the project, should the 99 year lease be granted by Ingonyama. Ingonyama have assured us that they will extend the lease upon receipt of this correspondence. We are extremely grateful to the Daitz Foundation and Project Build for their continued support in this initiative. We are optimistic that construction of FLP’s newest Community Library will begin in 2016. 08h00 Breakfast for participants Breakfast for participants. Breakfast for participants Breakfast followed by final get together of participants. It is hard to believe that another year has passed. 2015 has been a year where FLP have worked to further improve our practice and deepen the impact that we are having within our communities. The Facilitators and Coordinators have worked more closely within local Government structures, such a Reference Committees, liaising closely with other NGO’s, municipalities, SAPS, Department of Social Welfare and traditional leaders. Our work has expanded to include 1 new library at Kwa-Pitela, new Nal’ibali Reading Clubs and additional bereavement counselling groups, Homework Clubs in 10 Crèches and Schools as well as the Asifunde Sonke ECD Teacher’s Training Centre’s first group of graduates. Homework Clubs: The Department of Arts and Culture continues to provide invaluable support to FLP for the 5 FLP Libraries that we established and run in the rural areas of KZN. Their support expanded in 2015 to include Homework Clubs where FLP Facilitators, Coordinators and Library Assistants now include these Homework Clubs in their daily programme in addition to the other groups that they run. These Clubs are based around fun reading activities, with reading aloud, dramatization and art activities forming the basis of each of the sessions. In addition, children that do not have parents, caregivers or siblings to assist them with their homework, for various reasons, have an opportunity to sit in a group with a trained FLP staff member who assists them with this, after the reading activities. Mrs Cheryl Taylor, a special needs Educator, provides academic support and training for the Facilitators to meet the needs of the children in these groups. We have seen that this intervention has increased the number of children and adults from the community that visit the libraries. In addition, the feedback that we have received from the Schools has been encouraging and has definitely developed stronger ties with the schools and communities. Dlalanathi Bereavement Groups: The continued Support of the Solon Foundation and Children’s Chance for Life allow, Xolani Mofokeng, Nompumelelo Mbokazi, Sanele Ngubo and Zinhle Mbanjwa to continue to work with numerous traumatised groups. We work with groups of 8 children at a time, identified by the schools and communities, over an 8 week period. We still find, unfortunately, that we are unable to meet all of the needs simultaneously due to the sheer volume of children requiring intervention. We continue to receive positive feedback from families, schools and communities where we work. We have also noticed that many of the behavioural challenges experienced with these children, along with the resultant academic issues, are often seen to be overcome by the children after the intervention. This has resulted in Schools requesting permanent FLP Bereavement Groups being run at their schools in order to assist with the troubled children. Unfortunately the demands are so great, and the trained FLP staff so limited, that this cannot currently be implemented. It does, however, give us as FLP something to strive towards. Children’s Chance for Life: Congratulations to Phumla Ngcobo, a CCFL bursary beneficiary that has completed her Journalism Degree at Rhodes last year and has been working as an intern at Plexus Films in Cape Town and Dumisani Kheswa who completed his N6 and continues to excel in his studies towards his Diesel Engineering Diploma. The Graduates at Asifunde Sonke that are supported by CCFL, have all passed and graduated with the National Diploma in Early Childhood Development (ECD). The various students at schools and colleges also progressed well. Valley Trust Family Literacy Training: Phumy Zikode and Nomvula Phoswa continue to provide training and support for our partners, Valley Trust in Botha’s Hill just outside Durban. Valley Trust approached FLP to assist them to develop Family Literacy Groups, using the model we use, in various sites in the rural sites that they serve outside Durban. Phumy and Nomvula have travelled regularly to meet and train the Valley Trust Facilitators and monitor and evaluate their progress. Nal’ibali: The Reading Clubs continue to be vibrant and interactive groups of children that meet with the FLP Facilitators. The groups are encouraged to develop a love of reading and to share their experiences with each other and community members – many younger and often much older than themselves. This enthusiasm to share is nurtured by the FLP Facilitators using a variety of methods to bring to life the various stories that they tell as primers to the sessions. The new FLP Kwabhidla Community Library: We have run into a delay with this project as the Ingonyama Trust that oversee the property on which the new FLP Library is to be built, traditionally awards short term lases and then will extend these once building has been completed. This is a cause for concern with our funders as they question the security of a 3 year lease. I recently met with a delegation of Kwabhidla community members, the Headmaster of the Vusindaba School and the Ingonyama Trust in order to attempt to secure a longer lease. The Trust has been very accommodating and awaits a letter from the funder committing to the project should the 99 year lease be granted by Ingonyama. As this whole project has been so delayed, we will have to re-budget due to building costs having soared. We are extremely grateful to the Daitz Foundation and Project Build for their continued support in this initiative. We are optimistic that construction of FLP’s newest Community Library will begin in 2016. Zinhle and Sanele work in the Underberg School Mastery Unit, where they support reading and writing for additional language learners. In addition, they provides Psycho Social Support for students in the Hostel where they now both reside. This ensures that the children receive support that assists them to be healthy and happy. Staff Positon Charters and Individual Appraisals: In 2013, in order to continuously reflect upon our own practice, FLP embarked upon a journey where we hoped to shift staff beyond mere “Job Descriptions” that define what we expect of them, to a more intrinsically motivated “Position Charter” where they define excellence and expectations for their own personal growth within FLP, and in so doing encourage and foster growth in their FLP group members, adults and children alike. This Charter was personally crafted, under guidance over a 4 day period, emphasising the Key Performance Areas, Key objectives and Standards of Excellence they expected of themselves in order to meet the expectations that they have, that their co-workers have, that the organisation has and that their group members have of them in order to achieve relative “success” in their field. The follow up to this process has taken place monthly with Jill Frow, where she will meet with each staff member, chart their progress and coach them toward their aspirations that they have set for themselves in this “Position Charter”. In addition, the will meet with me and the other Coordinators, in order to keep on track and brainstorm changes necessary. In December, Jill, myself and the Coordinators, met with each staff member, in order to assess their year according to their Position Charter. It was an extremely rewarding, informative and remediative process. We are now beginning to see staff members proudly taking ownership of their “work” and constantly striving to improve through reflective practices. They are also gradually becoming much less threatened by this level of scrutiny and welcome suggestions and ask for help rather than feeling threatened due to shortcomings. UNESCO Windhoek “Inclusive and equitable Quality education and the promotion of lifelong learning opportunities for all”: FLP was invited to present at the 2015 UNESCO, all Africa Quality Education Platform – Southern Africa Regional Workshop on Literacy in Windhoek on 5 and 6 October, 2015. The work that FLP does was recognised as valuable and FLP were asked to share our approach and programme with delegates from all over Africa and the rest of the world. It was encouraging to see the level of interest in our work. The plenary session was insightful and provided many ideas for other delegates and FLP. We were the only Family Literacy Project to share at the conference. Department of Arts and Culture – Library, Language, Archives and Museum Services Conference, 25 November: FLP was invited to present at the DAC Conference in Durban. We shared about our libraries, Box as well as Buildings. The emphasis of the presentation was on building a culture of reading and making it a shared and valuable pleasure. Emphasis was placed upon intergenerational reading and storytelling using various groups and reading campaigns that FLP runs continuously. It was a great honour for us to receive such positive feedback from delegates. In closing, I would like to thank all of the supporters and friends that have taken an interest in our unique and extraordinary project. The year that I have spent at the helm of FLP, has been made so rewarding for myself and my fellow workers. May you have a blessed Festive Season. It was a wonderful month at all FLP sites especially in our libraries as lot of things were happening during this month. We celebrated Literacy Month by encouraging all our participants to read more story books to their families and in their communities. Many visited neighbours to read to them and their children, read in Schools and Crèches as well as at the FLP Libraries . We also organised literacy events where we invited people from the community in order to encourage them to read at home with their children. It was extremely successful in all sites, with many people attending and participating in the events. Many children also came to holiday programme and they thoroughly enjoyed the activities. It was so wonderful to see so many boys attending the holiday programme in the library. Malibongwe, the FLP Library Assistant is doing well in the library. He mentioned that people from the community come regularly to read newspapers in the library. Children are borrowing books to read at homes. During the reading session, Malibongwe took children to the library and read a story to them. 302 books have been borrowed during this month. Many children attended the FLP Arts Festival workshop at the library and they were happy to listen to some poetry. Two Authors from Fundza Books were invited to read stories and encourage children and adults alike to write stories. The Festival was a highlight for this isolated community and they celebrated the fact that published authors took the time to come and visit them during Literacy Month. During the holiday programme children enjoyed the art activities especially the younger ones as they really enjoyed blowing the confetti balloon and making pom poms. Everything is working well in the library. Crèche children continue to come to the library to play with toys and dolls. Bonisiwe first reads them a story and lets them draw, they enjoy staying in the library and it`s not nice for them when it`s time to go back to crèche. 541 books were borrowed in September. Crèche children come with their teachers to attend sessions in the library. During the FLP Literacy Event, 58 people attended the programme. 255 books were borrowed from the library during literacy month. 128 children attended the library holiday programme. Many exciting things have happened at FLP in the past 3 months. Two staff members have graduated. Nompies Mbokazi, Graduated with a Bachelor of Education, Foundation Phase degree and Zinhle Mabanjwa has graduated with a Diploma in Early Childhood Development. Zimbili Dlamini continues to study and is currently writing her UNISA examinations. We have held very productive meetings with our partners in the CWP. The Dhladhla Foundation and Insika have both committed to facilitate the revival of the Khulisa Abantwana Home Visiting Programme in the areas in which they have been awarded their respective contracts. The FLP Team, Community Members and previous CWP Home visitors are very excited that this valuable work will be revived shortly. We are excited to be able to continue meeting the needs of existing Families and ECD children and also to reach more families that were not previously part of the programme. The local Community Reference Committees, that include Tribal Leaders, Government stakeholders and other community leaders, have been putting pressure on our implementing partners to implement Home Visiting again. We are very happy to be able to provide facilities for other NGO’s in the area to hold meetings and conduct training. Our Resource Centre continues to be used by Save Act, Peace Club Foundation and Nal’ibali as a training and meeting venue. The training that the FLP team members benefit from, as a result of this, assists us to continually develop and hone our staff’s skill set. It is a real draw card being able to offer accommodation to trainers at our facility as this just makes for much easier training sessions. communities. There is a great need for this, as many of the caregivers and family members are illiterate and are thus unable to assist children with homework. There is an increasing number of the elderly caregivers or grandparents left looking after small children as the parents are working away from home. Our Facilitators continue to be approached by parents in their communities to please assist. FLP is starting two Pilot Homework Clubs, One in our Library and the other in a School where we currently run a Nal’ibali Reading Club. Xolani Mofokeng, Sanele Ngubo and Zinhle Mbanjwa were privileged to attend the UNISA Annual Child Trauma Conference in Durban in May. Much useful knowledge was gained, and shared. A very motivated team returned, better equipped to continue working on this very valuable part of the Family Literacy Project. The networking and knowledge sharing has inspired and equipped the group to deepen the valuable work that they are doing with Preschoolers, young children and teens. In order to continue building upon our Counselling Team’s skill set, our partners, Dlalanathi conducted a visit to the FLP Resource Centre and met with Jacqueline, Zinhle, Xolani and Sanele in order to discuss the Trauma Counselling and Khulisa Home Visiting Programme. Linda Smallbones recommended training offered by Hilary McLea of the Warehouse. Hilary is an experienced Loss and Grief Counselor and Educator, based in Cape Town. We were thrilled to be able to register Xolani, Zinhle and Sanele for Hilary’s Course, Managing Loss, Grief and Continuous Trauma, from 8-10 June. The Counselling Team will be offering a day of training for the other FLP Facilitators and Coordinators in order to better equip them to deal with issues related to loss and grief, which is unfortunately a very big part of each of their lives within their respective communities. Training for Coordinators: Curriculum Development: Project Arts & Culture, Education & Training. The FLP Coordinators were invited to attend training on Gender: Early Socialization through the arts programme. This valuable training, facilitated by TREE, has provided material for our Khulisa Abantwana Home Visiting Groups, Child to Child Groups and the Library Holiday Programme. The Peace Clubs will also have some of the ideas incorporated into the curriculum Phumy develops for them. The FLP Coordinators, Phumy, Zimbili and Florence will be offering training for the other FLP Facilitators at our Team Week. Phumy and Zimbili have begun supporting 8 Community Crèches in the KwaSani and Ingwe areas using Monitoring and Evaluation tools developed by FLP and Noah’s Ark. Their wealth of ECD experience is assisting the Educators greatly and we are already seeing the Crèches evolving from “baby sitting” centres to bright, safe, fun and engaging places for the 0-5 year old children. This valuable support is part of the Asifunde Teacher’s Training that we offer. FLP embarked on a new approach to staff contracts this year. The Coordinators, Jill Frow and I met with each staff member individually in order to go through their Job descriptions with them. In 2013, every staff member employed at FLP, including the Director, was guided through the process of producing a Position Charter that aligns one’s job description with Key Performance areas, key objectives and standards of excellence that define individual and collective excellence according to each of our job descriptions. We are confident that the two days spent doing this, has assisted all of us to strive to deepen the impact we are having in our community work, by striving, collectively to excellence. Jill Frow and the Coordinators will monitor and evaluate the staff according to these criteria when they conduct their monthly Site Support Visits. This will assist us in our ongoing Staff Appraisal. Save Act, our Community Savings Group partners, continue to meet at the FLP Resource Centre regularly. This initiative has been remarkable in assisting to improve the standard of living and particularly access to cash, for many of our FLP Group Members. Now, not only are many of the Savings Club Members able to purchase items such as School Uniforms, but they are able to engage in various income generation projects in their communities as well. We are very excited to have finalized the arrangements for this initiative. The lease for the land, upon which we will be building our latest Community Library, has been concluded and signed by all parties. The Ingonyama Trust has kindly leased FLP land, upon which we will construct and manage our fifth Community Library. The Vusindaba Community is ecstatic about the news. We hope to begin the construction of the Library in the second part of 2015. We are going to be extending Noah’s Ark and the Asifunde Training Centre. We plan to build, and equip, a new classroom, an ECD Resource Library and construct new outdoor play equipment. Nedbank has funded this initiative. This will, we believe, broaden our ECD training base, as we will be able to accommodate new students and offer an ECD Resource Centre/Library from which our Rural Crèches can draw Educational Toys and Supplies, on loan.